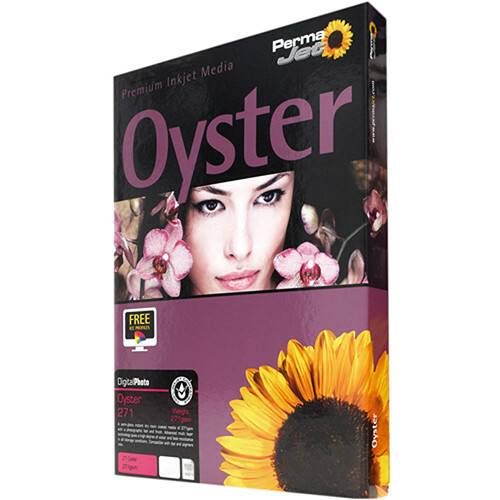 Offering an oyster/pearl finish with a classic photographic feel, this 25-pack of A3+ sheets of Oyster 271 Digital Photo Paper from PermaJetUSA will provide users with a great all-around paper for their images. It has a resin-coated base featuring a UV-protected microporous coating that offers both instant drying and a high water and fade resistance. The paper is also hefty with a basis weight of 271 gsm and a thickness of 10.2 mil. Additionally, it has a great whiteness of 129% that will allow for the creation of color and monochrome prints with a wide dynamic range and brilliant colors. Box Dimensions (LxWxH) 19.2 x 13.4 x 0.9"